At this time of our evolutionary path, we find ourselves traversing the portal that began with the Full Moon in Libra on March 20 and that catapults now with another powerful and stabilizing Full Moon at 29 degrees of this same sign. This is a phase in which many of us are experiencing the deep transfiguration that is taking place at the moment. The increase of light that we are actually embodying is so potent that many of us are noticing how we are aligning to even higher aspects of ourselves, beginning to open our hearts to new levels of consciousness, and hence wisdom. As the Moon in Libra opposite Uranus, which conjunct the Sun, the opportunity for change is greater. When we talk about Libra, we speak about love, relationships and balance. However, in order to bring this balance into ourselves or physical lives, first we need to work on the proper transmutation for this change, and subsequent balance, to occur. This is precisely one of the gifts that this Moon and its alignments offers us, if we are ready to be challenged by these potent, but at the same time, loving frequencies. This Moon's essence gives us the gift to create harmony within, in our body, as well as in our earthly lives and relationships, which is the main theme from this loving passage - to create conscious and equal relationships based on authenticity and mutual respect. As we are all unique, for some this passage will be about nurturing their bodies and regain balance. For others, depending on where this Moon falls into your chart, will be about an specific area in which you could bring more equilibrium. However, as I always say, it is all what you feel from within what you should follow not what is human, fixed and follows old mental beliefs. To be able to do this healing/clearing during, first we need to work on cleansing ourselves from egoic beliefs and manipulations. It is important that we do the proper emotional work required for us to maintain a soul reunion free of past traumatic experiences that can only lead us to create a relationship based on victimhood, toxicity and control. This Moon's portal will not only be about focusing on our physical lives and relationships, remember that for us to create the harmony we desire in these two aspects of our lives, first we need to do so from within. The most important relationship is the one we maintain not just with ourselves but with our God Self. When we are not yet living within Divine Love, when we feel unworthy, and our main aim is to please others above our own soul desires, then we are not fully appreciating, loving ourselves, unique abilities and the mission we brough here to fulfill and that no one lese can do. When this occurs we are not embracing ourselves, which is the main reason why many cannot create the balance they desire in their tangible lives and relationships, for they cannot manifest something they do not have and give to themselves first. This is why it is so important that instead of covering our empty voids with egoic attachments, addictions etc. we regain strength and be brave enough to move inward and see what is not unified yet, for this is the root of all that is not working out as wish, in our physical lives. Abundance, balanced relationships, the job that gives us the opportunity to serve from a space of joy and gratitude, and all we desire, cannot flow if we do not appreciate the God Spark that lies within and that acts through us, at all times. For we cannot appreciate and see in others what we do not find within ourselves. Others are not different than us, it is our ego the one that compares incessantly. The same God Spark we see in a child, in a wounded person or in a precious animal, is within you, and until you do not become aware it of, love it and value it, you could not move forward and create all you need for the journey you so desire to manifest. No one else is doing this to you, no one else is sabotaging your path, but your own egoic self in an attempt to keep you disempowered and in a "safe" familiar state of being. During this Moon, we will have a wonderful cosmic gift with the interdimensional stabilizing frequencies that we are receiving for us to find this inner love. 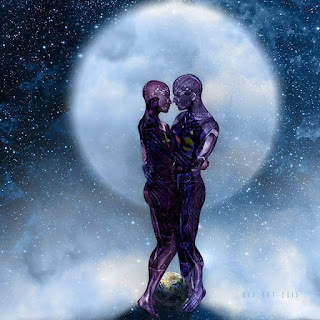 For the ones who have already found the love that they are, these frequencies will also help them to see their own magnificence, so they can reunite with others that like us have already seen who they truly are and are ready to maintain conscious relationships with us, as we continue to evolve and embody new levels of love. As you know there are many things happening beyond our limited planetary human reality. There are certain important portals that open in specific periods where we are ready to receive, especially now that our Planet is already ascending into a new harmonic universe. This is one of these unique moments in which our Planet, outside of our human sense of time and space, is aligning with other interdimensional stellar forces that are assisting many of us, who consciously desire to continue expanding our wisdom, while we are still humans. These frequencies are also meant to be anchored by the ones whose soul roles involve working with the planetary fabrics, in the restoration of the structures that were deeply manipulated eons ago, and that are now - since 2017 - beginning to crumble. These structures not just controlled our planetary grids but entered through its manipulation, the 3D programs - sexual and narcissist ones between many others - that continue to enslave many who are fighting for liberating themselves from the matrix, finally embracing their true essence. These stabilizing frequencies come when we are ready and have worked with our bodies, otherwise we could not hold the higher frequencies embodied. In my previous article, I shared what I call the God Pattern, come back there, if guided, for this is a wonderful opportunity to use it not in a micro level, but in a macro one - working with the specific numbers (dimensions) 6 and 7 - to anchor within the stellar frequencies that our Planet is now ready to receive and that this portal is offering us. This is one of the many techniques you can use to create the enviroment required for you to begin directing these energies into your body. Again, this is not about the ceremony you do in itself, for in truth it is all about the intention and how you direct it, what truly matters, but for your human self to feel surrounded by what it considers to be sacred and what helps it creating the proper vibration for it to receive these frequencies. For some this will be a period of deep transmutation in which they will be challenged to surrender and consciously direct these energies to do the proper cleansing required. This will involve to command these frequencies to dissolve the lower energies that are still within their bodies and to being working on opening, strengthening and protecting their auric fields more so they can prepare themselves to finally step into this new dimensional space, which is nothing else than the state of being that we choose to hold. Embrace your own process whether you are healing, rejuvenating from it or finally in the desire state of being you wish to have. All serves a purpose and there is always a time for all of us to rise and another one for us to fall, for there is no other way, within this dual universe to truly ascend, if it is not by experiencing descension too and the different cycles that there is within Creation, in this plane. If these frequencies are helping you to commune with higher aspects of who you are and offering you more wisdom, bless them. If on the opposite, they are showing you the lower layers of yourself that are impeding you to manifest the true you, bless them too, for they are helping you and leading you to the state of being you wish to reach. When we desire to be in a place, state of being or in another situation that we are not yet, we are not seeing the gift of the moment, even though the moment may be surrounded by may challenges. When we do not surrender and accept whatever gift the Divine gives us, we are not appreciating the Divine Plan and the Love that this Infinite Consciousness has for us. We believe we know more and then we fall into egoic traps, which is why humility is so important. Therefore love yourself and all you have chosen to manifest, at this moment, for this moment, without you even knowing or realizing it yet, is already taking you to the perfect place, with the perfect soul mates, and conditions that you desire now. Our dense realm takes time, be patience, love All, and know that what your soul desires to experience, is already done and it is coming. Your mission is not to control and manipulate what you cannot, but to be open for what your soul sends you, and use it for your human growth, without any judgments. This is a very powerful time, especially by having the Moon quincunx Venus, to heal old relationships and traumatic wounds that are still impeding us to embrace new reunions who are based on equality and loving co-creations. However, during this time and even more by having this connection between the Moon and Venus, many could feel an urge to be loved - searching in the wrong places. It is when we feel these human feelings, which are perfectly usual, when we most need to move inward and give this unconditional love to ourselves, for this is the pure and authentic love that we truly desire and that many continue searching in outer places and people rather than within ourselves. At this time, many who are experiencing a massive awakening will no longer pass through the long period of awakening, that I for example and many of us experienced, for there is an acceleration in their awakening process that will help them to integrate and remember in a faster way. This is why it is so important that we begin by building the strong pillars that will sustain ourselves and bodies as we continue to grow and evolve within this endless spiral of Creation. Beginning by clearing our ego is one of the first tools we shall work with, if we desire to fully listen to the voice of our soul, above any other mental/egoic voices that are not aligned with our soul purpose and desires. As important as it is to work with our ego is to heal our emotional body of all wounds and debris that still reside in both, for we cannot embrace an authentic reunion if first we do not embrace ourselves and all that we consider to be painful - understanding what these feelings want to awake in us and healing what is not yet unified. When this basic, but not easy inner work is done, clearing miasmatic cords is one of the most essential techniques that will help us to begin working on soul retrieval - becoming whole again to be able to open ourselves to the new companions that are meant to touch our journey, at this moment of our human experience. At the Moon time it is vital that we become the neutral witnesses of our unique lives, realizing where we are still governed by our egoic self. This is what will help us discern if we are following a path based on unconditional love to ourselves and others or if we are yet using old egoic mechanisms to blame others for what we have not yet healed within ourselves. There are many indicators that will help you distinguish if you are maintaining a conscious relationship, which are the ones based on equality, respect, loving interactions, co-creative purposes and balance, or if you are yet clinging into a relationship that is based on fear, attachment and egoic patterns that only diminish and disempower the two involved in the relationship. Healthy communication: Communicating in a healthy and loving way is one of the first premises that balanced relationships have. Many people understand by communication to blame the other, to yell at the other or to simply express their view and not paying attention to what the other is feeling. This is toxic and only feed the egoic patterns that are present within and hence in the relationship, which is why it is so important to become the witness and be honest with ourselves to realize if we are the abuser or the abused one, or we interchange these roles. Take responsibility: This is one of the most important things when we are in a conscious relationship. When we do not act from a loving space, for we are humans and we all make mistakes or simply we choose differently or regret not to have done something better, we take responsibility for what we said and done. We do not blame our partner or any other person with whom we are maintaining a relationship with. We try to go deeper into the core of why we acted as we did and accept the consequences. In a toxic relationship, especially where we have not worked in clearing the ego, it is all about blaming the other and use the victim role as a way to punish the other and defend ourselves by trying to impose our view and simply impose that we are the innocent ones. Equality: In a balanced relationships both partners have embodied, and balanced, their feminine and masculine essences and have done their inner work first, so now they are ready to coexist and co-create in a space of respect, empowerment and equality. No one is manipulating the other by using force, as it happens when one of the people involved in the relationship manifests the distorted masculine or feminine by being a narcissist. Authenticity: Both show themselves as they truly are. When there is self-acceptance there is no need to show qualities that we do not possess simply because our egoic self thinks our partner will prefer us if we behave in a certain way, or any other kind of fake personality traits, for we have accepted and loved ourselves as we are and now the purpose of the relationship is to precisely allow the other to also do the same. Humility: Is essential to recognize when we have erred or simply when we have not totally acted from a space of unconditional love. This is one of the most important ones to recognize the ego and to work with it, if necessary, until we are ready to fully immersed in a conscious relationship. These are some of the main values that a balanced relationships must have in order to consciously co-create with another soul mate. In the moment we become the witness and we still observe narcissism, egoic patterns, victim/victimizer roles, between many other unloving behaviours, it is important that we begin to work with them from within rather than blaming the other person or ourselves. We are here precisely with many soul agreements that help us evolve by showing us what we have not yet unified and loved within. There is no point in being constantly accusing ourselves or others of what have not worked or done properly, for this is what helps us ascend and become the sovereign free beings that we are, in nature, and that we are meant to remember here. Only compassionate witness and love towards ourselves and others will help us in realizing these painful behaviours - healing them and showing us the way to manifest an authentic and loving relationship that is aligned with our soul true essence and mission here on Earth. This is what we, a humans, have to learn/remember, to follow the rhythm of the Universe instead of forcing our own one. For what we release, when the time to do so comes, what we left empty, the Universe will fill it, with infinite love, abundance, new soul reunions, and anything we need in this physical plane. We just have to flow, we just have to BE instead of spending all the time trying to fix what is not broken and never was, to begin with. It is all about making the choice to cease our unnecessary suffering, by flowing with what IS, or continue feeding the illusion. I wish you a magical, loving and blessed Moon, Beloved Companions!